HbRun | Viva Clipper ! HbRun is a console interpreter and program ( command file / script file / .prg / .hrb ) runner for the Harbour Language. have to set it explicitly. It can work as interpreter when invoked without parameters or can execute xBase / Harbour source code in .prg file or compiled Harbour Portable Objects (.hrb) file given as parameter. Type of file is recognized by extension used with <file> parameter. If not given then .hrb is used. In other words, HbRun can be use in both interpret and batch mode. Regarding parameter given or not, when calling HbRun this ‘mode’ determined by program itself. If a parameter ( usually a .prg or .hrb file name ) given, program run in ‘batch’ mode, runs (executes) given script file and end. If no parameter given, program enter interpreter mode. Using HbRun as an interpreter, may be very useful, productive, and educative for xBase programmers. Too many xBase programmers was learned everything, including DBF file system and xBase programming language by famous “dot prompt”. Today many xBase programmers uses HbRun daily basis. When HbRun begin, open a console screen with two basic area: status bars at top and dot prompt line at bottom. You may enter here a command to see the result. 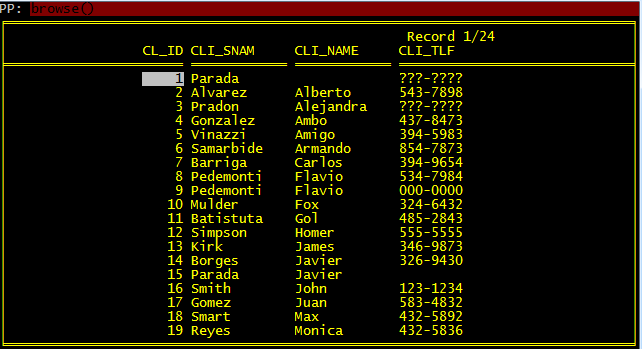 The structure info of a table frequently requires while daily work to xBase Programmers. – HbRun keep a “history” for commands entered (for a limited count of commands of course). You can access (and re-enter when required) by using up and down keys. Moreover this history may be usable after re-invoke HbRun. – Though Harbour Language is essential, some legal Harbour commands / functions may be un-recognizable by HbRun. – Though some legal statements works in interpret mode, may not works in batch mode (such as Browse() ). Last Note : No further explanation required for experienced xBase programmers; try, see and learn. 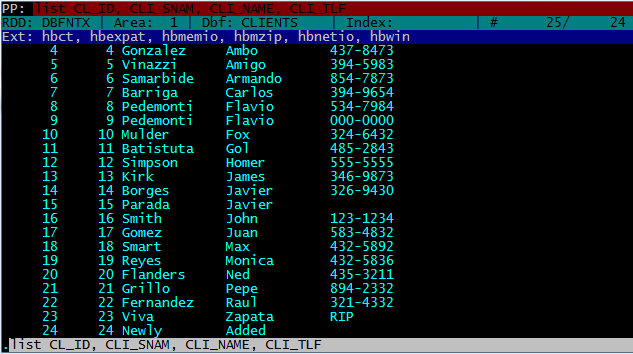 Display structure of current table ( .dbf file ) on screen.
? "Fld Name Type Width Dec"
? " 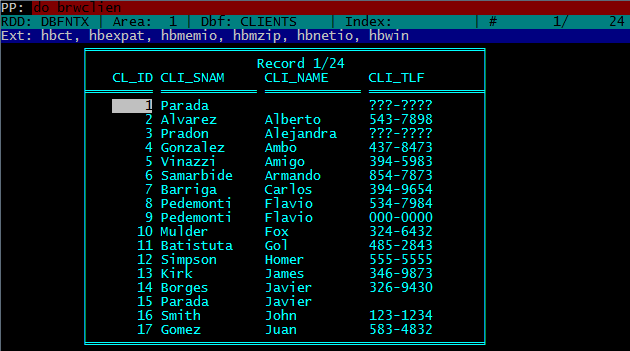 --- ---------- ---- ----- ---"
List structure of current table ( .dbf file ) on screen. Save structure of current table ( .dbf file ) to a file. AlteFName := LEFT( ALIAS(), 4 ) + "STRU"
This entry was posted in Utilities / Tools and tagged .hrb file, .prg file, batch mode, browse, command file, console, console screen, DIR command, DOS box, dot prompt, filter, FOR clause, Harbour, HbRun, History, Index File, interpret mode, interpreter, inverse color, library, LIST command, program, RDD, record no, runner, Scoreboard, Script File, SET COLO TO, Skeleton, snap, source code, Status Bar, work area. Bookmark the permalink. Pingback: Harbour Reference Guide Summary | Viva Clipper !